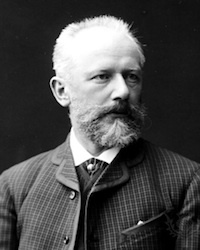 June 25, 2015, 9:37 PM · Ah, the Tchaikovsky Violin Concerto. "It is pretty much the yardstick by which we measure good violin playing," said violinist James Stern at a lecture called "Interpreting Tchaikovsky's Violin Concerto" at the Starling-DeLay Symposium on Violin Studies at The Juilliard School last month. Stern has taught the concerto to many students, and he's found some consistency in the places where we all tend to blunder in this monster piece. Students may listen to master recordings of the work, but they don't always copy what they hear. That said, many ranking performers miss things that are in the score, so listening is not enough. Learning by watching the greats is a little like trying to learn magic by simply watching David Copperfield, Stern said: "That's not going to work, because so much is hidden." The same is true in music. For example, the listener can't know what the performer is feeling physically -- Heifetz, for example, appears in videos to be fairly still when he was playing, but in all likelihood he was having a vivid physical experience. Watching a great artist also does not reveal his or her mental process, musical and interpretive ideas, and how they relate their part to the orchestra part. The Tchaikovsky concerto has a rather unusual introduction, and how you think about it -- if you think about it -- greatly affects how you play it. "It's unique," Stern said. Definitely not a double exposition, "we hear a theme that we're never going to hear again, and the introduction is weirdly disconnected from the rest of the piece." That said, the orchestral introduction does present an important musical element: the idea of syncopation, and "syncopation is going to be extremely important in this piece," Stern said. In the three measures before the soloist's entrance, the syncopations double in speed. The metronome marking for the orchestra introduction is quarter=126, and after the soloist's cadenza, the soloist winds up at quarter=80 -- considerably slower, and much more like a love song than the stormy music that preceded it. There are a number of ways to look at the soloist's role here, and Stern offered some metaphors: For example, the orchestra may be playing the role of a crowd at a noisy meeting, where the conversation has turned to argument and chaos; then the soloist speaks as the one person in the room with a wise word, bringing back order to the discourse. Or a different scenario: the orchestra is the wild stallion charging, and the soloist grabs hold of it, slows it down and starts calming it. Stern talked about the concept of "mapping," or comparing things so that their parts match up. In songs, we map the music to words and their syllables and stresses. For example, in the tune "Oh Susanna": "It rained all night the day I left, the weather it was dry..." Nonsensical as the words may be, they map well to their music, both in terms of syllables and emphasis. An example of poor mapping might be in "Jingle Bells," where pretty much everything is off: "Oh what fun, it IS to ride, in a one-horse open sleigh..." A person speaking this would probably say, "Oh what FUN it is, to ride in a one-horse open sleigh..."
And at the very end of the cadenza, one has to keep that feeling of suspended syncopation, even with the fermata. The soloist acts very much like a conductor; "every time you want something special to happen, you have to show it in advance," preparing at least one beat in advance, otherwise "the whole thing sounds like mudslide." And in some cases, you don't need to rush forward because Tchaikovsky has written the acceleration into the music, as in with m. 32-35. "How are we going to articulate this jeté motion in m 35?" Stern said. "There are some people, like me, who are too eager to have the bow do ballet and lose control." Stern talked about many other things, among them something that came up as various people performed the Tchaikovsky over the week: should one slow down at the poco più lento (m. 114, Oistrakh version), when sextuplets become double-stop sextuplets. Of course, there is no one answer. Did, perhaps, Iosif Kotek, when consulting with Tchaikovsky about the concerto, suggest that part should be slowed because it was difficult? We know that the concerto's dedicatee, Leopold Auer, wanted the double stops removed. Dorothy DeLay had everyone do it a bit slower. Yet these days, violinists do not need to slow it down to make it playable, they can play it up to tempo, so maybe they should. In the end, it's up to the performer. In conclusion, Stern advised violinists to think about the dramatic potential of this concerto, to find balance in its rhythmic complexity. As the soloist, "you are the one leading the many, not the other way around," Stern said. You are the one to tame the wild stallion, and to give room for the orchestra to fit into your sound.